Once you see how rich in color and texture these mens navy blue crocodile shoes by Belvedere are, you'll be thanking yourself for the making the right choice in buying online some of the finest and elegant crocodile shoes that money simply can buy no matter the price. 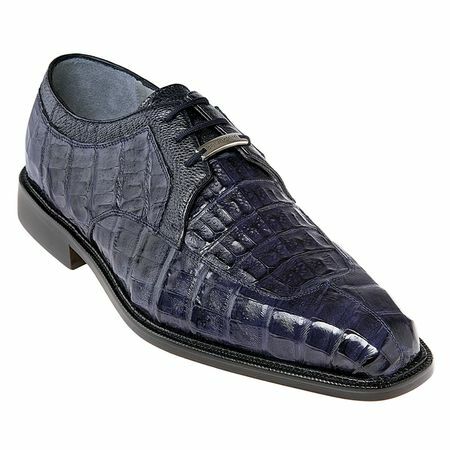 The Susa by Belvedere has all of the hallmarks of what fine hand made mens navy blue crocodile shoes should be. The Susa by Belvedere is a rich navy blue split toe all over crocodile skin shoe with just a bit of navy blue ostrich skin trim to give some contrast and texture. Like all Belvedere shoes, these mens navy blue crocodile shoes are hand made with full lambskin leather linings and hand made full leather stitched sole and heels.